Liollio Architecture is honored to announce that the 2019 American Institute of Architects South Atlantic Region (AIA SAR) has recognized Liollio projects with three Regional Design Awards. Hampton Health Clinic in Varnville, SC received a New Construction/Substantial Renovation Honor Award. 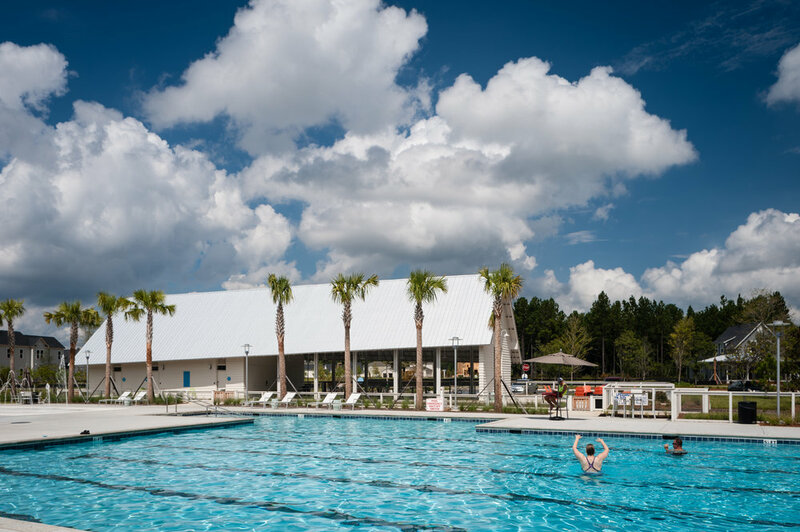 Brighton Park Swim Club in Summerville, SC and James Island Town Hall in James Island, SC both received New Construction/Substantial Renovation Merit Awards. Because these projects were the result of team work and collaboration with clients, Liollio would like to extend sincere gratitude to Hampton County, SC, WestRock and The Town of James Island, SC, along with their project team partners. The AIA South Atlantic Region is comprised of three state chapters: GA, NC and SC and is home to more than 5,500 members. Events surrounding the 2019 AIA SAR Annual Design Conference, themed the ASPIRE Experience, took place in Asheville, NC over the course of three days, April 14 to April 16. A new type of collaborative conference, ASPIRE brought together the design and construction community to share stories and influence designers to create a better future. Breaking the mold of the traditional event and taking full advantage of the location, AIA SAR utilized the architecture, community and surroundings of Asheville to create this immersive environment of inspiration and design celebration. 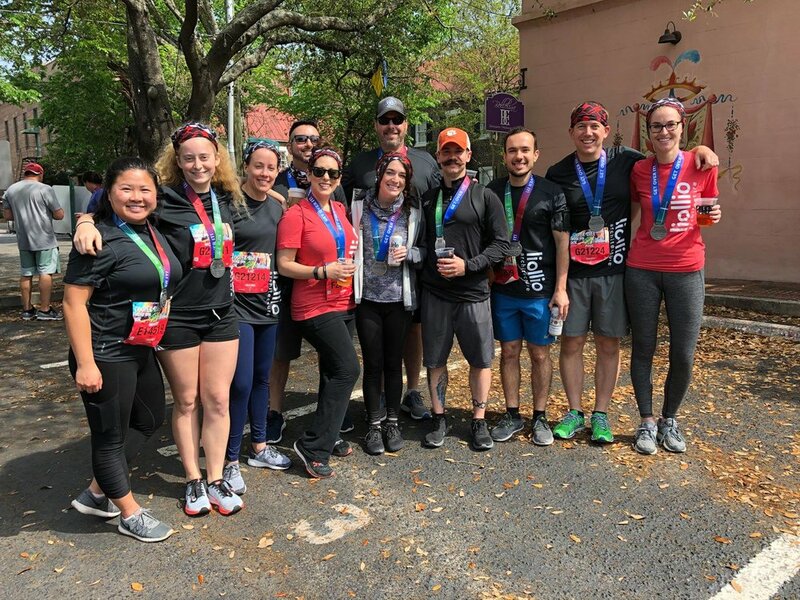 We are proud of our 2019 42nd Annual Cooper River Bridge Run Liollio Team! Cheers to an awesome group! Congratulations to all who participated in this year's race! 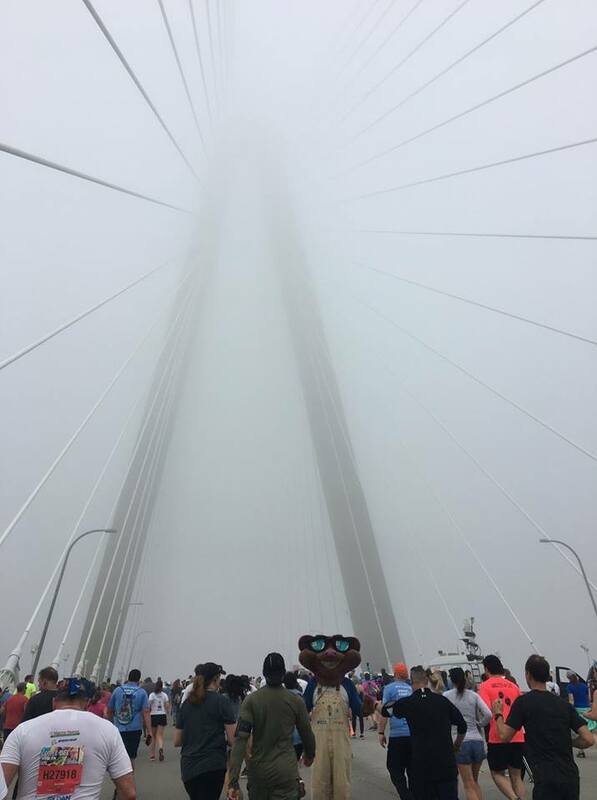 For a look at this year’s official winners, visit https://bridgerun.com/. Don't miss the Louis Waring, Jr. Senior Center Grand Opening & Ribbon Cutting Ceremony on March 5. Mayor John J. Tecklenburg, City Council of Charleston and Roper St. Francis Healthcare invite you to attend the Grand Opening and Ribbon Cutting Ceremony for the Louis Waring, Jr. Senior Center on Tuesday, March 5, 2019, 12:30 p.m. at 2001 Henry Tecklenburg Drive, Charleston SC. Tours of the facility and open house activities will follow the ribbon cutting. For more info visit here. Ralph H. Johnson VA Medical Center’s fully renovated and expanded Emergency Department will be open to Veterans next week. This project more than tripled the square footage in their Emergency Department, adding nine new bays, an additional nurses station, a workroom for staff and privacy for our Veterans. Liollio is proud to have been part of the team on this important , helping the VA to expand access to care for Veterans in their new space. BERKELEY COUNTY, SC (WCSC) - For the first time, Roper St. Francis is expanding its medical reach to Berkeley County. On Friday, the healthcare provider is opening its new medical office building in Summerville. Until now, they only had an urgent care center in the area. The grand opening event is from 10 a.m. to 12 p.m. on Friday. The offices are at 300 Callen Boulevard in Summerville behind all the major construction right near where 176 meets 17-A. Those who stop by can tour the building, grab some free food, and even pop in to a free health fair. This state-of-the-art, three-story building will house a variety of specialists, including breast surgeons, orthopedic surgeons and OB/GYN physicians. Medical services here will range from dermatology to cardiology. Jennifer Crawford will be the Chief Nursing Officer at the future Roper St. Francis Berkeley Hospital. She says this new medical office building was designed with the patients in mind. "We've looked at all the attributes down to the color scheme matching the natural environment, because there’s proof that’s therapeutic in the healing process,” Crawford said. “We’ve added three elevators. One at every proximity to the building, so there's no long walking distances." The medical offices are set to start seeing patients on Monday, Dec. 10. The healthcare provider is also building a hospital next door which is set to open in October 2019. Don't miss Resilience by DESIGN: From the Blue Ridge to the Coast - Friday, September 21, 2018. Register today: Click HERE! Interested in becoming a Resilience Partner? Contact Tracey Waltz. AIA South Carolina is pleased to announce Resilience by DESIGN: from the Blue Ridge to the Coast, its second biennial conference on Resiliency, to be held in downtown Greenville at the Clemson One space. This year's theme will emphasize the importance of Resilient planning across South Carolina and beyond coastal communities. Conference sessions will focus on Resilient Design issues affecting all regions in the state, including climate change adaptation, wild fires, tornadoes and other wind hazards. Keynote speaker Laura Lesniewski, a Principal at BNIM, will discuss her firm's approach to "creating beautiful, integrated, living environments that inspire change and enhance the human condition." The 2011 AIA Firm Award winner, BNIM is a Kansas City based interdisciplinary practice that is shaping the national and global agenda for progressive planning, responsible architecture and design excellence. We hope you'll join us for a one day "mini-conference" where members of the design and construction industry from across the state and region will gather, learn, and discuss the vital role they play in both the design and recovery of more Resilient Buildings and Communities. Liollio's Michael Edwards, Associate and Health & Wellness Leader, led an AIA Charleston building tour of the Louis Waring, Jr. Senior Center recently. As a follow-up to his tour of the Center in the Fall of 2017, attendees were given an insider’s look at project progress, lessons learned and finish installation as the project nears completion this Fall. The Senior Center is a City of Charleston project in partnership with Roper St. Francis Healthcare constructed on the campus of the Bon Secours St. Francis Hospital in West Ashley. The new 16,000 SF center is nestled in the woods, providing active adults a community retreat from their daily lives to an oasis engaged in nature. Liollio's Michael Edwards, Associate and Health & Wellness Leader, along with Elizabeth Bernat, Director of Senior Services at Roper Saint Francis Healthcare, led a series of roundtable discussions at the National Association of Nutrition and Aging Services Programs (NANASP) - National Council on Aging (NCOA) 2018 Conference in Charleston this month. The roundtables focused on the design and community engagement process for the Louis Waring, Jr. Senior Center, a Public/Private partnership between the City of Charleston and Roper Saint Francis Healthcare, to open this Fall. The NANSP/NCOA Conference is an annual conference hosted by the National Association of Nutrition and Aging Services Programs (NANSP) and the National Council on Aging (NCOA) National Institute of Senior Centers (NISC). The conference brings together leaders from senior center and aging organizations as well as officials from the SC Department of Aging and Disabilities, U.S. Department of Health and Human Services and the AARP Foundation. Michael Edwards is the Liollio Project Manager of the Louis Waring, Jr. Senior Center located in West Ashley. Elizabeth Bernat is the Executive Director of the Lowcountry Senior Center and future Louis Waring, Jr. Senior Center. 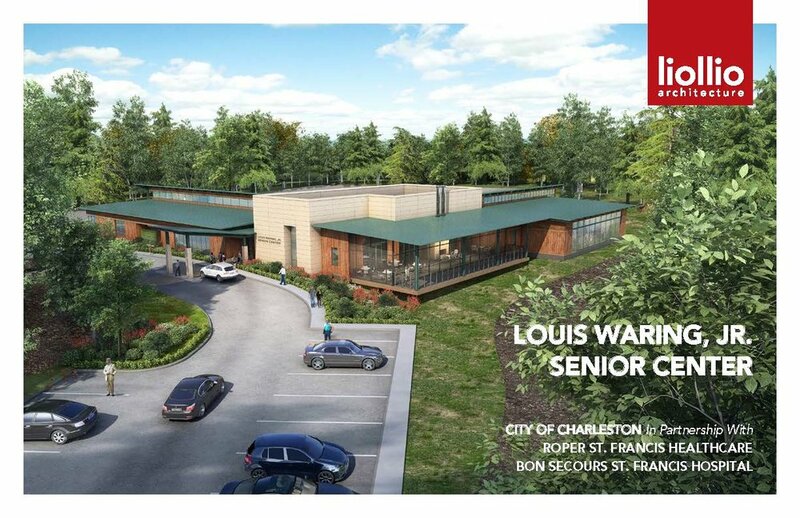 For more information about the Louis Waring, Jr. Senior Center, visit Liollio on ISSUU or view the Designing for Senior Community & Wellness Brochure. Click here or on image above to see our process.